If you own a lawn, you know that maintenance can be time-consuming and physically exhausting. In particular, trimming hedges can make you sweat like you are in a sauna. Sure, you can do it with shears, but this isn’t exactly the most efficient method. Instead of shears, you can take advantage of the best gas hedge trimmer. With our help, you’ll realize how such a piece of gardening equipment is a worthy investment. Before getting yourself a gas hedge trimmer, you need to know what exactly you’re looking for. Here, you’ll understand why some people prefer gas hedge trimmers while others choose an electric type. Moreover, it will give you a good overview of what to evaluate in a trimmer model. 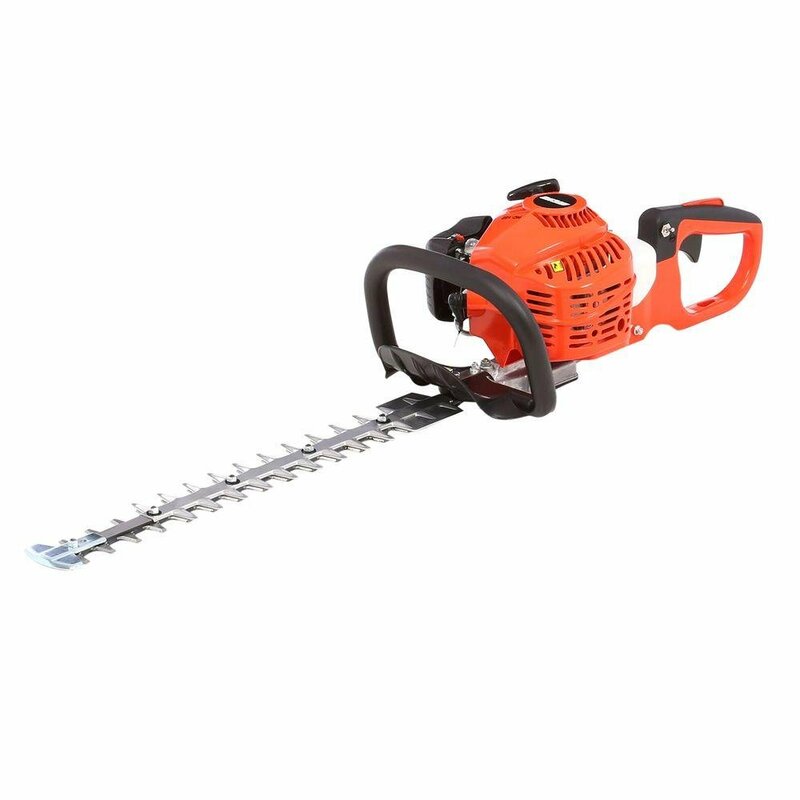 The power output of a hedge trimmer will vary depending on the type. You see, there are two primary types of hedge trimmers: gas hedge and electric models. In terms of power, the initial offers a lot more than the latter. Despite the relatively low power output of electric hedge trimmers, some are more capable than others. High-voltage electric trimmers do their jobs faster, but they are less affordable than the low-voltage variants. When you need to accomplish jobs as fast as possible, you should earn yourself a gas hedge trimmer. This can surely trim a hedge no matter the size and the type of hedge. Even if electric hedge trimmers are less powerful than gas hedge trimmers, they still perform considerably less loudly than a gas hedge variant. So if you want to deal with “dear” neighbour, you could settle for an electric model. If you prioritize powerful engine over a quiet operation, when using a gas hedge trimmer, you should still get earplugs. Manufacturers have information on the decibel levels of their machines, so check it out. In general, a long blade length will enable you to quickly trim your hedges. The average hedge trimmer will have an 18-inch blade, which would be enough for most lawn maintenance tasks. 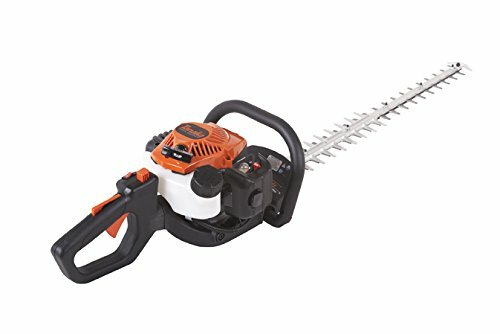 This length also works better than longer blades if you are trimming in a narrow area.If you have big hedges, you can pick 20 inches long blades or even longer. Just determine first if you can maneuver it well around your area. How much your hedge trimmer can cut down significantly depends on the length of its blades, but there are also two other factors here: blade gap and blade type. Blade gap refers to the distance measured between the blade teeth. The longer the blade gap, the more capable a hedge trimmer will be in handling various branch types. Lawn owners are typically okay with a blade gap measuring between 3/8 of an inch to ¾ of an inch. But you can go for commercial hedge trimmers having at least an inch of blade gap. As for the blade type, there are what we call single-single blades and double-sided blades. The initial is much safer to use than the latter because the blade will be facing away from you during operations. This is a great option for new users of a hedge trimmer. On the other hand, double-sided blades save you a lot of time in trimming hedges since both sides of the equipment cut at the same time. If you are new to using hedge trimmers, a light model would be both easier and safer. In addition, you won’t feel burden holding this for quite some time. And a heavy trimmer will provide more power to cut down big branches and speed up the operation. It’s not just the weight that determines the comfort of using a hedge trimmer or not. Let’s consider about the feature of a trigger lock control. Without this, you’d have to constantly press the trigger for every trimming operation. Cordless electric hedge trimmers are light to carry around and start quickly. In contrast, the more powerful gas variants might be difficult to control for some owners. ​As previously mentioned, the more efficient double-sided blades, the less safe to use. A good way to prevent injuries is to carefully read the instruction manual and to look for various safety features. For one, some trimmers have tooth extensions, which put your blades away from harming you. Another safety feature is an automatic stop, which drains power away from the blade the moment you let go of the trigger. The inclusion of front-handle shields also keeps your hands away from the blade. Another important factor is how easy or difficult it would be to maintain the hedge trimmer. All of them will need maintenance. However, in most cases, gas trimmers are usually harder to maintain than electric models. First, you have to regularly check the gas hedge trimmer for the amount of remaining fuel. Then, you need to refill the machine with the correct mix of oil and gas.Clearing the vent should also be considered by replacing the spark plug. Once the season is over, the gas engine needs to go through a stabilizer before putting the hedge trimmer into your storage. ​Regardless of the hedge trimmer type, you must always make sure that the blades are sharp. Dull blades delay the cutting operations. Always have replacements ready – and don’t forget to keep the trimmer clean after every use. Now that you know the differences in features and performance of hedge trimmers depending on their type or model, it’s time to look into three gas hedge trimmers that caught our attention. Below, you’ll find an overview of what makes them worth the investment. First, we have the Poulan Pro P2822 gas hedge trimmer. If you are unaware of the brand, you should feel secure if you have had Husqvarna equipment before. After all, Husqvarna owns Poulan Pro, which means that they share the same inventive technologies in the power tools industry. The Poulan Pro PP2822 might feel heavy for new users, but 18.43 pounds shouldn’t stress you out during trimming operations. In fact, it’s pretty light considering that it’s a gas-powered machine. Powering this gas hedge trimmer is a 28cc two-cycle engine that feeds on a potent mixture of gasoline and oil as fuel. With such a hefty fuel engine, the Poulan Pro PP2822 is designed to provide sufficient power to its blades. Instead of single-sided blades, this trimmer uses lengthy 22-inch dual-sided blades. Not only are they made of steel for long-term sharpness, but they are also serrated, rotated blades that accelerate the cutting process. Poulan Pro is aware that using a gas-type trimmer is expensive, so they made sure that the 28cc engine is fuel-efficient. Thus, each gallon of gas and oil will last relatively longer when compared to the average gas hedge trimmer. People who care about the environment will love this product. The PP2822 trimmer complies with the requirements of the California Air Resources Board (CARB) to limit its chemical emissions as much as possible. The PP2822 gas hedge trimmer is fairly easy to use, especially with its spring-assisted recoil starter. Another factor to its improved maneuverability is its swivel position handle. This handle ensures you have a good grip all the time so you could precisely control the PP2822. Furthermore, the handle reduces the vibrations. Poulan Pro even included a front grip acting as an emergency brake. The next gas hedge trimmer weighs just 11.4 pounds but utilizes a 21.1cc Pure Fire 2-cycle engine designed, which was designed to be powerful enough even for commercial use. The gas-to-oil ratio is at 50:1 and the fuel tank capacity is at 10.1 fluid ounces. More importantly, the Tanaka TCH22ECP2 complies with both CARB and the Environmental Protection Agency (EPA). To complement this high-quality engine, the Tanaka TCH22ECP2 has 30-inch three-sided dual-reciprocating blades. Not only are the blades a full 12 inches longer than the average trimmer blades but it also goes beyond the two-bladed setup for more efficiency. It was clear from the start that this is made for professional landscapers, particularly those looking to cut down branches up to three-quarters of an inch thick. The Tanaka TCH22ECP2 provides quick controls, safety, and comfort. For one, a purge bulb generates a quick start, especially with the S-Start feature that significantly reduces the pull-force by half. Consequently, the 5-position rear handle allows the user to accordingly adjust the machine. A four-point, spring-mounted anti-vibration system reduces the chances of experiencing fatigue. In addition, this gas hedge trimmer has a forward-facing exhaust. Ideally, this should prevent bushes from getting caught on fire during trimming operations. The aforementioned three-sided blades would not harm the user thanks to the blade safety tip. Lastly, the Tanaka TCH22ECP2 is covered both by a 2-year commercial warranty and a 7-year consumer warranty. 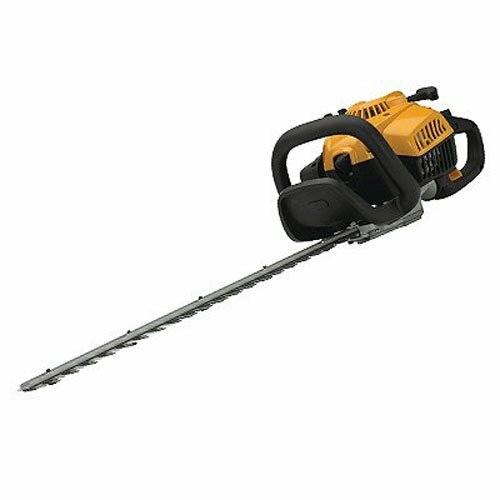 The third gas hedge trimmer is the Echo HC 1-52, which uses 20-inch RazorEdge blades. These are double-sided and double-reciprocating blades for precise cutting and reliable sharpness. To prevent accidents, the sizable rear handle is ergonomically designed with a safety guard. On the other hand, a sturdy support bar enables straight cutting operations. Powering the blades is a 21.2cc two-stroke engine with a 50:1 gas-to-oil ratio. The fuel tank has a capacity of 15.6 fluid ounces, but what makes it distinct is the noticeable feature. You could easily see if the Echo HC 1-52 needs a refill. This hedge trimmer even uses a commercial-grade air filtration system to keep the engine clean without constant maintenance. Aside from a two-year commercial warranty, the 11.8-pound Echo HC 1-52 offers both a 5-year consumer warranty and a 90-day rental warranty. In the end, our favorite gas hedge trimmer is undoubtedly the Poulan Pro PP2822. It has a 28cc two-cycle engine that could outperform the engines of the gas hedge trimmers from Tanaka and Echo. The Tanaka TCH22ECP2 might have the largest blades with a three-sided configuration. 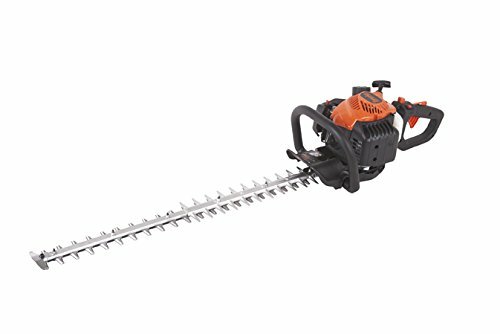 The 22-inch steel dual-sided blades of the PP2822 have just enough length to cut through different branches without being difficult to maneuver in narrow areas. Moreover, we felt that it was truly fuel efficient. We never ran out of fuel whenever we were trimming the hedges. This helps us save money in the long run in terms of maintenance and refueling costs. Of course, we are also fond of Poulan Pro PP2822 complyingwith CARB requirements to lessen the harm done to the environment. The recoil starter works without a hitch, and the swivel position handle helps us effectively control the trimmer. Whenever we were cutting the bushes, vibrations were kept to a minimum, and the front grip could always be used as an emergency brake. Overall, the Poulan Pro PP2822 is a gas hedge trimmer that’s easy, effective, and safe to use.